How to connect young people in a need for a life-changing experience with an organization that provides them with a year of “hard work, low pay, miserable conditions” and a real opportunity to learn skills, earn scholarships and make friends? The answer is surprisingly simple. Include them in the process and understand their needs, motivation and affinities. After years of limping along by making manual updates to a dated templates, the CCC website needed a major upgrade. 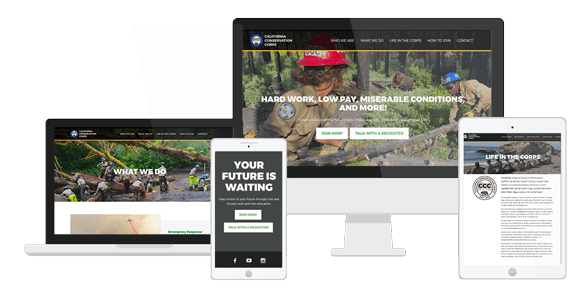 On bootstrap budget, the CCC needed a solution to increase youth applications and improve the content authoring workflow. Our strategy and UX teams gathered tremendously valuable data through user interviews. The results of that insight is directly evident through reduced text, more prominent images, and quickly scannable pages with clear calls to action. Initial feedback to the new site is extremely positive. Edits are easy to make, thanks to a template-oriented WordPress implementation, and KPIs are all moving in a positive direction. Image content is particularly important to the CCC. Our team conducted user surveys to determine the exact qualities of images that were most likely to create a positive impression among audiences. The SymSoft design and development teams worked closely with CCC stakeholders to arrive at a content authoring experience that met the functional and financial specifications of the organization. Our custom implementation of the designs uses the power of Divi for WordPress with reusable site-wide components and global control of visual styles.